Well, it’s as good a time as any to write up about the first seven weeks of the 2015 High School Football season. I had intended to write recaps of Kentucky and Tennessee from Week 0 and New York from Week 2. In between, there was also one game from West Virginia. The rest were my usual games around Ohio and Pennsylvania. This is a trip I’ve made many times in the past. With Kentucky starting a week earlier than Ohio they had the added bonus of playing doubleheader ‘bowl games’ as well. Two years ago I added Tennessee to the itinerary with a rare ESPN-televised Sunday afternoon game. I then found that Tennessee also regularly hosted Thursday night games to open the season in the northeast corner. Apparently in consideration of Bristol Motor Speedway hosting the Saturday night NASCAR race. It was in Bristol where my 2015 season started off. My wife and I had just gotten married that Monday, and had taken a trip through Shenandoah National Park and the Blue Ridge Parkway on our way south to Bristol. After seeing 114 games last year with me (of my 127), this was our first as a married couple. Tennessee High School in Bristol (as opposed to the Virginia High School across the border in Bristol, VA) has one of the most unique stadiums in the country. 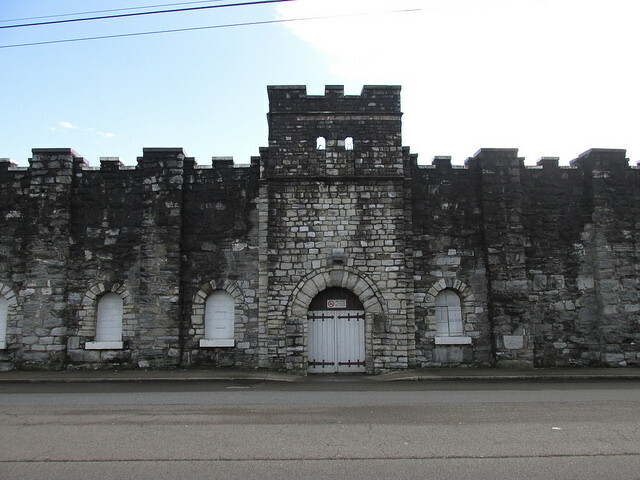 Known as The Stone Castle, Bristol Municipal Stadium has one of the most imposing facades you can find. Built as a public works project, the stadium features tall stone walls surrounding the perimeter. Complete with turrets and towers at each corner. The home and visitor stands themselves also feature towers accenting the design. Three concession stands done in wood and more modern styles dot the stadium grounds. One to the south, and two to the north. The field its was newly remodeled with field turf. The Tennessee Vikings (an odd name befitting a team with such an impressive stadium) hosted the Dobyns-Bennett Indians of nearby Kingsport. The game itself, though a big rivalry, was decidedly uneven. D-B, as some called them, stormed out to an early 14-0 lead after one, weathered an early second quarter comeback before pulling away the rest of the game, winning 45-14. After the game it was a drive north toward Kentucky. Cutting through far southwestern Virginia, we stopped in Norton before cutting through Cumberland Gap and into Kentucky. With two bowl games lined up for that evening, we had time to site see and also stop and check into our hotel before the games. The Sunset Motor Lodge in Stanford, KY is nice place to stay. Also one of the few places anywhere near Stanford to get a room. That night was the PBK Death Valley Bowl at Lincoln County High School’s Bill Ed Leedy Field on the southern outskirts of Stanford. This bowl game had been going on for over a dozen years, yet Lincoln County had a very poor record with the games. This year wasn’t any different. The stadium itself was a small stand that sat with its back to the afternoon sun. The field was grass with insignias painted on it. A large hill supported the homeside stands, as the top row was at ground level with the top of the hill. This also made a walkway behind the top row and people passing by could momentarily block the view of the pressbox and radio announcers. The sponsorship by PBK was actually two companies. WPBK, a radio station, and PBK Bank. The games themselves were lively and entertaining. Neither one getting out of hand, but neither one really in doubt. The favorite seemed to simply have to ‘hold on’ to win. Henry County Wildcats defeated the Lincoln County Patriots, 28-21 and in the nightcap, Bullitt Central Cougars defeated the Madison Southern Eagles, 35-27. After spending the night in Stanford, it was a short drive north to Lexington where we booked our room for Saturday night. Opting to just drive home Sunday, we stayed at the Ramada on the east side of town. With the first game between Frankfort and Paris set for 6pm, we had plenty of time. Around 4:30, we headed east the short drive to Mt. Sterling and to the high school. It was there that we found out the game had actually started at 5pm. The lone announcement apparently was made on Facebook. Despite every newspaper and website showing a 6pm start, the organizers decided to move it up an hour. Luckily, we were only a few minutes late, but it was very poor management on their part. It also meant another hour in the hot sun. Cunningham Field was surprisingly sparse and it isn’t situated well. For being modern, the design was lacking. The school sits atop the hill on the northeast corner. A long hill runs from it to a fieldhouse building for other sports. The stadium itself, though, stands just in front of the hill, completely supported on risers. The school atrium itself doubles as the restrooms and concessions. Which means if you’re in the top row, you have to walk all the way down the stands, over to the steps, and climb back up all the way even further up to reach the restrooms. Hopefully nobody ever really has to go. For handicapped, it’d be even more difficult as the sloping ramps that climb up the hillside as it tapers off are in the middle of the northern endzone. This also means the home side faces into the sun. And that extra hour is noticeable. The Paris Greyhounds upset the Frankfort Panthers, 21-12. After staying close throughout the game, Paris’ 14-12 lead after the third quarter held up thanks to a touchdown pass on 4th down midway through the fourth. The final game of the weekend was between the host Montgomery County Indians and Collins Titans of Shelbyville. Though the crowd was a bit better, the game wasn’t. Though it was close, it was a chess match of field position. Tied 0-0 through three quarters, Collins finally connected on a 68-yard touchdown pass with 5:01 left in the game to come out victorious, 7-0. After that, it was a leisurely drive home on Sunday. Sticking around locally, only Ohio games were an option. A first time visit to Girard’s Arrowhead Stadium on Thursday night against Niles McKinley kicked off the weekend. With Pennsylvania not starting for another week, we made the very short drive west to Campbell Memorial’s obviously named Campbell Memorial Stadium for their game against Cortland Lakeview. After spending a few years of my life in Cortland, it was a school I always cheered for. With different circumstances, I probably would’ve grown up there. The stadium in Campbell is nice. The home side features a double-deck design, which is absurdly overbuilt for a school in Division VI. The only issue is the home side again faces the sun. The game itself was one-sided, though not really a blowout. Campbell hung on well, but couldn’t make any headway, losing 21-0 to the visiting Bulldogs of Lakeview. Saturday was a last minute decisions. There were a few games to attend, but there was a surprising lack of afternoon games. At the beginning, only the Cleveland area featured an afternoon game. St. Wendelin’s sudden shuttering of their football team left Dola Hardin Northern open and searching for an opponent. A quick rescheduling with a road game to Beallsville for the afternoon had made my decision easy. I already was planning to see the Bridgeport-Valley (WV) game on Saturday night, even if there was no early game. However, Bridgeport and Beallsville are rather close together. Despite what’s going on in Beallsville with the school, the football team was attempting some very heavy lifting. A meager roster, a rough hack-job of a schedule, and the looming unknown of what will happen next year. The 14 players for Beallsville gave it their all, but it was just not enough against the much faster and talented Hardin Northern team. To their credit, they never gave up despite the odds. The stadium in Beallsville is a small gem out in the hinterlands of southeast of Ohio. With block foundation, the heavily constructed wooden stands don’t feel cheap the way some wooden stadiums do. A small concession stand sat off to the right. A cemetery stood in stark contrast behind the home bleacher. The stadium sat mostly east/west and the closed school building sat to the northeast corner. The newly constructed school was down the road, east of town. The big issue was, apparently with the building closed, the only restrooms were port-a-potties. Which, my wife wasn’t thrilled with, at all. Driving east, we then took Route 7 north along the river to Bridgeport. Bridgeport’s Perkins Field is tucked in behind some businesses, homes, and Interstate 70. Rather unassuming, it has a central driveway leading to the north end of the field, with a gateway selling tickets. Standing just a few buildings down is Sonny’s, a very good restaurant to stop at before or after a game. Decently priced and the food is well made. Perkins Field is a former dual-purpose stadium. The baseball diamond sits to the left after entering the stadium grounds. Concessions and merchandise are available along the the north end near the lockerrooms. The visitors section is a small metal stand planted onto the left field line, in fair territory, as are the light standards. The home side sits in the right outfield. An old block structure completely with a roof and supports. Though this hinders your view, it protects from the weather and increases the intensity of the cheers. On a warm night, it also feels like a lit tinderbox. This was my second time at venerable Perkins Field, and again enjoyable. Though the home town Bridgeport Bulldogs lost in a game expected to be much closer, 24-8. After a relatively normal week in Ohio, it was back on the road. This time the destination was north central New York State and Syracuse University’s Carrier Dome. In 2014, we made two trips to this stadium. Once in September, and once in November. And again, we forgot about the stifling heat. The stadium’s name is for Carrier, the inventor of modern air-conditioning and refrigeration. The stadium itself lacks this modern amenity. On a warm September day, the dome itself can grow quite uncomfortable. The positive-air-pressure supported dome means you’re in a bubble. Cut off from the outside air. It also lacks any form of meaningful circulation and the air stagnates at ground level. Traditionally, NYSPHSAA Section 3 hosts ten games at the Carrier Dome’s Kickoff Classic. Two on Friday, four on Saturday, and four on Sunday. This year, those plans were toppled by Syracuse hosting Rhode Island on, originally, Saturday night. The plans called for the Kickoff Classic to have two games on Thursday, 2 games on Friday, 1 game Saturday morning, and four games on Sunday. After another scheduling change by the Orange to move their game to the TV friendly Friday night, the schedule was further altered. This time two on Thursday, Four on Saturday, and four on Sunday. And, with Sunday night making for a late night, they shifted one game to Friday morning. Finally with the schedule set, it New York high school football in the dome. Local sectional contender Cicero-North Syracuse played Kingston, winning easily 35-14 to open the season. The night game was Rochester-area Victor defeating Baldwinsville, 34-13. Having the hotel for three nights, my wife, who by that point already found out was pregnant, decided to sleep in and skip the matinee game at the Dome. It was a wise decision, as Cazenovia crushed Amsterdam, 47-0 in the sweltering heat of the dome. With our options open for Friday night, and her wanting to see a game after missing one, we combed the schedules to find a decent matchup and one that required a minimal amount of driving. On the southeast side of town, Syracuse Nottingham was hosting Rome Free Academy at Nicholas DiBello Stadium. Though Henninger was ‘the Cleveland Glenville of Syracuse public schools’, Nottingham’s stadium and school campus was nice. The parking was little to be desired with almost exclusively street parking. The sports complex sat atop the hill behind the high school including a soccer field, baseball and softball fields, tennis courts and the centrally located football stadium with track. The stadium was modern and new with field turf and Nottingham’s intersting block N logo at midfield. Endzones were orange with blue writing for “BULLDOGS” in each endzone. Now, a note about Rome Free Academy. They are a public school. They are just a very old public school. Started in 1860, they are one of 3 “Free Academies” in New York State. There are a few elsewhere, as well. Newburgh and Elmira are the others. They predate any modern attempt at a public school system. Today, they are no different than any other public “High School” in the country, but retain their historical name. For all intents and purposes, they can simply be called ‘Rome’ in the way that someone may call ‘Lakeview High School’ simply Lakeview. Nottingham jumped out to an early 6-0 lead in the first quarter and appeared to be trying to make that hold up the rest of the game. Rome did score, finally, early in the fourth quarter on a slant pass, but their try was no good and the game was tied, 6-6. With overtime looming, Nottingham connected on a 41-yard touchdown pass with 46 seconds left to take the 12-6 lead and hang on for the victory. The small crowd was delirious on the touchdown pass. On Saturday, it was back to the dome for the four-game set. The first game was between Binghamton and Auburn, which traveling Binghamton won easily, 42-20. The second game featured earlier mentioned Newburgh Free Academy against Syracuse Henninger, also mentioned earlier. Newburgh Free Academy was founded in 1799. They are a very big school, accounting for 3,459 students in grades 9 through 12. The encompass the entire city of Newburgh and New Windsor, and parts of other towns. Henninger, as I mentioned, is traditionally pretty good in football. Last year we watched them in September beat Christian Brothers, a very good private school in Syracuse, and then in October saw them win the Section 3 championship. This year, however is not their year. The Henninger Black Knights had no answer early, giving up six touchdowns and conceding a safety in the first half to trail, 44-0. Two more touchdown runs in the third quarter made it 58-0 and one more for good measure ended the contest, 64-0. The third game, and last we’d see for the day, was Buffalo Canisius against Shenendehowa, affectionately known as “Shen” by their fans. This was a last minute scheduled game, as Canisius’ original opponent opted out. Canisius, not a member of NYSPHSAA with the other Monsignor Martin Athletic Association teams around the Buffalo area were set to play a big public school from out east, but instead Shen stepped up into the void. Though they made a dent in Canisius’ armor, it wasn’t enough as they fell, 28-7. With Rochester Aquinas and Syracuse Christian Brothers Academy up next, my wife and I decided to skip it. The game didn’t interest me much, and she didn’t feel like sitting in the hot dome for another game. With only three games scheduled for Sunday, we had already decided to pass on the finale. With the original schedule, we had decided to miss the fourth game to get an earlier headstart on the drive home. By eliminating a game, they pushed back the start time of the first game. So, on Sunday, our first game was East Rochester vs. Watertown, again two teams from outside the Syracuse area. Both brought small crowds on a Sunday morning. East Rochester pulled away in the second half, winning 34-24. And the last game for us, was Newark Valley against Utica Notre Dame. Utica Notre Dame was defending Section 3 champions, but fell badly to Newark Valley, 32-14. After that, it was a long drive home and our last ‘big trip’ of the early season. This week was a bit strange. It was the first time since Week 0 last year that we didn’t see games together. Her family had planned a ‘girls weekend’ at Disney World for the weekend and she loves Disney World. Because of that, and the general disinterest in games on Thursday, I worked the entire week. Losing track of time, I had planned to attend the Greenville at Slippery Rock game on Friday night, but realized I’d miss a considerable amount of it driving over to Slippery Rock. So, instead, decided to drive the few miles to Campbell and again see a game at Campbell Memorial Stadium. This time the Red Devils were taking on the Lakers of Pymatuning Valley. I have family from Andover, so I was hoping Py Valley could make a game of it, and they did for a short while. Trailing 7-6 at the half, the game turned in Campbell Memorial’s favor, 27-6 as the final. Making up for my missed Thursday game, was an interesting afternoon doubleheader at Griffin Stadium on Akron’s west side. Cardinal Mooney traveled to take on Akron North and Akron Buchtel was scheduled to host Canton GlenOak. The first game was basically decided the moment the game was scheduled. Mooney won easily, 41-12 in a game that was never in doubt. The second game was in mist and rain, as Canton GlenOak jumped out to a 21-0 halftime lead and won, 21-6. Both games had meager attendance. The threat of rain kept some away, as well as the early matchup being entirely one-sided. Buchtel had a decent crowd during the rain. The stadium, lacking lights, was situated behind Buchtel’s high school building and is big enough to hold a crowd. Whether it can actually ‘hold’ the crowd is in doubt, though. A wooden stadium with planks for both seats, aisles, and steps, it is moderately terrifying. I’ve never been a fan of wooden stadiums, and this one was no exception. The ‘sway’ in the stands with fan movement, and while walking was unsettling. After the game, it was the long drive home. With a driving rain storm, had initial decided to skip a late game. I had a few options, and one obvious game to attend: Neshannock at Shenango on New Castle’s south side. Shenango for years had played all their home games on Saturday night. And against one of their local rivals, had opted to rekindle that history by hosting a game on Saturday night. With a large crowd in the rain, I arrived at kickoff and found a place to stand on Neshannock’s side of the field toward the concession stand endzone. The overflow crowd was into the game, and Shenango was going for an upset against Neshannock, who had made it to the WPIAL semifinals the previous year, losing to Clairton in a heartbreaker, 48-42 in OT. This year, though, the Shenango Wildcats were out for a little revenge. A scoreless game was broken open in the second half as Shenango returned the kick for a touchdown to make it 7-0. The scoreline held into the fourth quarter when they added a 1-yd run to make it 13-0. Neshannock came back two minutes later on another 1-yard run. With the rain fizzling out, the ground became playable and passing a little less futile. Neshannock connected on a 36-yard touchdown pass to trail 13-12. Going for two, Shenango stuffed their run attempt to keep the lead. With under two minutes to go and Neshannock looking for the stop, Shenango burst through for a 51-yard touchdown run to take the game, 20-12. After working extensively with my wife away the previous week, I took this week off and we decided for a longer Thursday night trip. St. Marys (WV) had just built their new high school and stadium. With an off-day, they hosted their contest with Tyler Consolidated (WV) on Thursday night at the not quite officially named stadium. The oddly named Blue Devils (donning purple and yellow uniforms) were taking on the Silver Knights. The stadium was packed, and the stadium and surrounding sports complex was impressive. The crown jewel, though, was the football stadium. Elevated well above the field, it spanned almost 80s yards. An ornate ticket booth, restroom, and concession building sat at the corner welcoming fans. The track and stands lined up well. Elevated so high, there was a huge concourse area behind the sideline fenses and the start of th stadium. Including room to move about below the front portion of the stadium. The locker rooms were tucked underneath the stands. The field was modern artificial turf with purple endzones with yellow writing “ST MARYS” and an interlocking SM at midfield. The game itself wasn’t nearly as nice as the new digs. St. Marys was the clear favorite, and jumped out to a 29-14 lead at the half. Tyler Consolidated was all but out of it, though, as they couldn’t muster the offense needed to make a game of it. St. Marys went on to win, 49-14. For Friday, instead of traveling to Warren (PA) for Greenville’s game, we decided to take in a small school Mahoning County school, Jackson-Milton, hosting Leetonia. The Jackson-Milton Bluejays were 3-0, and still trying to make their first trip to the playoffs. They were hosting hapless Leetonia at Jackson-Milton Community Stadium. Before the game, we stopped at Korner Restaurant, which is a definite must for anyone in the area. Especially on Friday for the fish. Very good food. The game itself wasn’t nearly as good as the fish. Jackson-Milton jumped out to an early lead and won easily, 44-6. The stadium, again, was mostly wooden. The visitor side looked like modern aluminium bleacher. The home side, to the north, was hair-raising old wooden planks. The stadium itself, was nice with decent parking located right on County Route 18. Saturday was a drive south to the small river town of Industry, home of Western Beaver. They were hosting Chartiers-Houston. Not only were the Golden Beavers looking for their first win, they were looking for their first points. It was my first trip to Western Beaver, as years ago I had an afternoon choice between South Side or Western Beaver. I opted for South Side, primarily because they were closer to Steubenville when I lived there. It was a rather fortiutous decision, as South Side now has lights and no longer plays Saturday day games. So, now it was Western Beaver. Western Beaver Stadium only has stands on the west side, and are at least modern aluminum bleachers. The game was, unfortunately again, one-sided, as Western Beaver couldn’t crack into the win column. They did score their first points, losing, 47-6. The night game option was basically Warren JFK versus Columbiana Crestview. My wife didn’t feel like attending, so we stopped at home, had dinner, and then I drove on to Mollenkopf Stadium for the matchup between Division V and Division VII state championship hopefuls. It was a good game, and Crestview won it in the end, 20-13. Thursday started with a trip west to Bedford for the televised Bedford-Maple Heights matchup. I had seen this rivalry game a few years ago at Maple Heights in the mud and rain and was looking forward to another contest. This time at the well appointed Bearcat Stadium in Bedford. I had been here previously for a Trinity game, and wanted to always see a game here with Bedford playing. It was, sadly, disappointing. The crowd was much smaller than I expected it to be. The game was decent though, as Maple Heights won 22-14. Friday was to my old hometown, Greenville, for their first official home games of the 2015 season against Grove City. Their first home game was moved to Grove City due to finishing touches on their conversion from grass to field turf not being completed. The wait was worth it, as Greenville now has one of the best facilities in Mercer County for football. The old soggy field with barely visible lines and yard markers was now replaced with vibrant green turf, sold white lines and numerals, a midfield logo and with GREENVILLE and TROJANS in yellow in opposing blue endzones. Also, in a bit of a twist, the player boxes on the sidelines were also blue. A ribbon cutting ceremony was held to mark the occassion of the new field’s use. And also, the opportunity was taken to finally give the stadium itself a name. Long known as Stewart FIeld in honor of the family who donated the land for the new high school, the stadium itself stood nameless. That changed, as Ed Snyder and Bob Stone, two of the all-time winningest coaches of the team had their names immortalized on the now named Snyder-Stone Stadium. Greenville went out in fashion, too, winning over Mercer County foe Grove City, 28-7. Saturday was a bit of an odd scheduling decision. 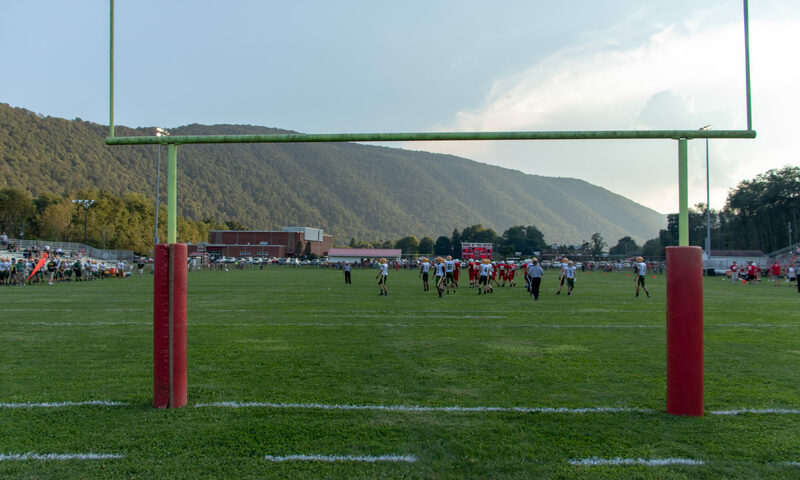 Beaver was hosting their Saturday night homecoming game as usual, but there wasn’t much for an afternoon contest, so we chose Summit Academy in rural Herman, PA. Summit Academy is for adjudicated youths and their sports history is minimal. One time has the team made the playoffs amidst the constant churn of new faces on the team from year to year. Their stadium, if you can call it that, consisted of a field originally laid out for baseball, and a few portable risers. A plethora of folding chairs were set out for the band and other fans. A rather impressive ‘press box’ was built on the far side of the field, essential to left-center of the baseball diamond, though without facilities or accomodations. There was one good thing about the field, though, was the rather step hill on the north side of the field. The top carried a large constructed S A with a knight logo. The area around it was paved with more folding chairs setup giving a birds eye view of the field. Next to it, sloping down toward the field, was a small grove of trees. Many spectators carried the folding chairs from the blacktopped open sky area and sat under the trees to watch the game. This is what my wife and I did. It was surprisingly tranquil and gentile. Valley, from New Kensington, was the opponent today, and they had little trouble with Summit Academy. The lone bright spot for the Knights was a fourth quarter touchdown run, to make the final 35-8. The night game was my now annual trip to Beaver. Between games we ate at a small Italian restaurant near the Beaver Valley Mall near Monaca called Rainaldi’s. The seafood pasta was very good. The one nice thing at Beaver’s antiquated concrete Gypsy Glen Stadium was the recent addition of bathrooms. Though they are still outside the stadium, they are a much better option than walking into the high school as was previously the case. You still require a pass to get out and then back in, but it is a small price to pay. The simple home stands are concrete with bleaches on each ledge. Without a track, the field sits close, and you get excellent views with the high school dominated your view to the west and north. Despite the west facing stands, a rather impressive hill sits behind the school, quickly blocking the sun well before the start of the game. If not for eating prior to the game, Beaver always has excellent gyros at their games, made by a local company that sets up a tent between the stands and the primary concession stand. The only complaint of the game is their opponent, New Brighton’s, horribly illegible road uniforms. White with a small maroon outline around tan off-white number. From a distance, they’re barely visible. Beaver, though, won easily, 28-14 in this Beaver County rivalry game. Thursday was another Cleveland area televised game, this time Medina Highland versus Aurora. The new facility at Highland is impressive. North Gateway Tire Field, though quite a mouthful, is a beautiful modern stadium. The small ‘hornets’ on the field were a nice touch. As is the green-lit sign mounted on the front of the press box. They also have a quite extensive team shop located near the concession stand. And selling Chik-Fil-A sandwiches was a bonus. The game itself was great, as Highland upset Aurora, 38-28. Friday was another Greenville game on their new turf, this time beating up the Corry Beavers, 35-7. Saturday was another odd scheduling. The only ‘interesting’ matchup was down in Johnstown and south of Altoona. Which, with the projected weather, didn’t look good. So, with the prospect of no rain in West Virginia, opted to see the Bishop Donahue game in Moundsville that night, and on the way, see Western Beaver host Neshannock. We knew the first game was going to be one-sided, but it did have sentimental reasons for my wife, as that is her alma mater. Western Beaver, though, were gracious hosts, as they practically gave the game away to the visitors. With a light rain falling at times, the sloppy field did a great job to equalize the game and slow down the speedy Neshannock team, but unlike Shenango, it wasn’t enough for the Golden Beavers to get the W. Neshannock won easily, 36-8. This was the second score of the year by the Beavers, both in games that I attended, up to that point. The drive south wasn’t that long, as we took the Ohio side of the river down Route 7 to the Route 2 crossing to Moundsville, and then drove north, past the stadium, and get dinner. After that, it was back to Monarch Stadium for the Bishop Donahue-Conotton Valley game. During my time in Steubenville, Conotton Valley was one of my favorite teams. A small school out in the countryside, originally with no lights at all (I believe they have temporary lights now), and won their first game in ages when I first attended. In this game, though, they weren’t in it. Bishop Donahue raced out to 38 first half points on a muddy field, winning 38-7 with little need to exert much the second half. The stadium is massive for Bishop Donahue games, but are probably the best locale for them. A John Marshall game, the stadium’s namesake tenant, would probably be fun to watch at this old off-campus facility. The Cleveland area televised games have been good options this year, as this time it was 6-0 Stow-Munroe Falls hosting 5-1 Hudson at rather cramped Bulldog Stadium. The stadium is ridiculously small for the home side crowd for a Division I team. The crowd for this game, despite television, was impressive. The game itself lived up to its billing. Hudson came on strong late, but couldn’t score as time ran out on the 17-10 Stow victory. Friday was back at Greenville for the third straight week as they hosted Hickory. At 5-0 and Hickory at 4-1, it was a big game for Region 3 supremacy. Greenville, unfortunately, couldn’t really bust through the Hornet defense, and struggled all game. An early touchdown opportunity was lost settling for a field goal, and the late touchdown wasn’t near enough, as they fell 28-9. Saturday is the regular “Homecoming Weekend” for several Western Pennsylvanian schools. Normally Beaver would be this weekend, but this time it was Burgettstown, McKeesport, Moon, and Freedom all hosting Saturday games. Having seen games in Burgettstown and McKeesport, I opted for the afternoon contest between the Moon Tigers and Chartiers Valley Colts. It was a beautiful, though warm, day for football. Chartiers Valley was the better team, but early on Moon’s special teams were keeping them in the game, registering two kickoff returns for touchdowns. It wasn’t enough, though, as Chartiers Valley pulled away for the 45-26 win. Moon is located just east of Pittsburgh International Airport. The township is also home to Robert Morris University and is still a rather thriving area of exurbian Pittsburgh. Home to over 20,000 people, it’s odd that it’s not yet incorporated. The Moon Area School Disrict campus takes up a good bit of real estate off newly named University Blvd. They also get kudos, for one of the best programs you will ever see a high school sell, all for only $5. Wirebound, full color pages, foldout team photos, etc. Very well done. The night game was a short drive away, though time was of the essence. With the 2pm start at Moon and a 5:30pm start of pregame festivities at Freedom, the 18 mile trip was a non-stop affair. Freedom is a small river town north of Ambridge and south of Rochester on the east side of the Ohio River. They were hosting, oddly enough, New Brighton. Despite their stadium being very close to route 65, their stadium is up a hill and a windy road from the highway. Worn grass and otherwise aging stands, the confines stand in contrast to the new addition to the middle school that domninates the southern endzone. Housing both restrooms and the new concession stand, it looks out of place. A wooden gateway to enter the stadium grounds proclaims “Freedm Bulldog Stadium” and housing the ticket booths. The biggest issue with the field is that it’s not big enough. Literally. The corners of the endzone extend out into the track. Which I think is dangerous. Also, the slope of the field abruptly ends, and the flattened track would throw off someone running to the corner for a catch which gives Freedom an effective, though possibly unused, defensive advantage. Freedom, the team, however, did nothing offensive most of the game, and New Brighton, in the illegible jerseys, won, 41-14. With a pregnant wife, our late season trips have been adjusted. We still plan on Iowa in Week 12 and Louisiana and Texas for Weeks 16 and 17. However, we’re probably going to skip over heading back to New York in Week 11 and have given up the idea of Ontario. Their schedule was pushed back a week, and are played on Monday, Tuesday and Wednesday. I have Browns season tickets, and they host the Ravens that Monday night. Also, I can’t tie those games into the trip to Detroit as I did two years ago. We may drive to Detroit or Indianapolis that weekend, or simply take in the WPIAL games at Heinz Field, depending on what day it is and what other games there are. However, everything is fluid at the moment. It’s up to her on travel, as it should be. She wants to do Iowa. It’s a climate-controlled dome, and there’s 12 games in three days. Iowa isn’t that far away for a drive, and the Browns are on the road that weekend. New Orleans and Houston, in Weeks 16 and 17 are going to be decisions made near the time of the trip. Being out of the cold will be good for her, and both are climate-controlled domes, as well. After that, we may see about going to Florida for Christmas with her family. But, plans are, afterall, very fluid. Right now, I figure I’ll be somewhere in the 70-80 games range by cutting a lot of travel out. Primarily New York. Also, instead of the Ohio OHSAA Championships in Columbus, we’re planning to attend the three West Virginia WVSSAC Championships in Wheeling. Though I’ve seen games at Wheeling Island Stadium in the past, I have yet to see a championship game there. So, giving up four games to see those. We may take in the Thursday night game in Columbus, but that is doubtful. Overall, it’s been a fun year so far. I hope to write again sometime around after Week 11 and the Iowa trip, next.